TULSA, Okla. — Tulsa police said they had to use pepper balls Monday night after rapper Travis Scott's concert was postponed. BOK Center officials announced two hours before Scott was to hit the stage that the concert was being rescheduled to March 26 due to "technical production issues." Witnesses said several people became frustrated and started rushing the doors. Police said they dispersed pepper balls, which they hit against the wall of the building, because the crowds were getting out of control. Police said no one was hurt and no arrests were made. 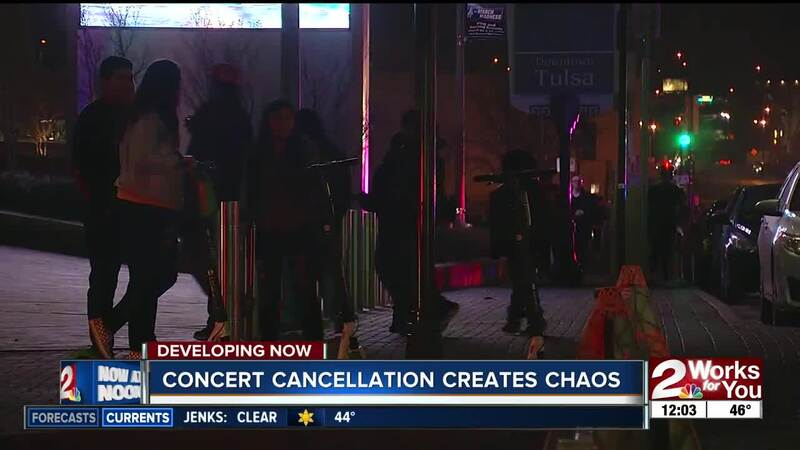 "To our knowledge, this is the first time TPD has gotten involved in a situation like Monday night at the BOK with concertgoers," police officials said. No, we’ve never had a situation like last night before. We’re just thankful that no one was injured. Tickets for the March 26 show will be honored and guests don’t have to do anything. Also, if a guest isn’t able to make it to the rescheduled show ticket refunds are available at the point of purchase. The rapper apologized about the concert postponement on Twitter.